I was shocked. Not so much at the language. I’ve heard Barry drop the F-bomb a time or two. But it was so bizarre to have Barry shy away from using a commitment contract. Barry is a world-class game theorist who hasn’t only written about the benefits of commitment devices; he’s also used them to lose weight. He’s the father of the bathing suit diet. Back in 1993 on the first day of a business school course on game theory, Barry promised to teach his last class of the semester in a Speedo if he hadn’t lost fifteen pounds by then. The threat of humiliation was a pretty strong commitment, and sure enough his business students never got to see what I just saw this past summer at the pool – the sight of Barry Nalebuff in a swimsuit. So it came as a sobering surprise to hear Barry Nalebuff express such unbridled emotion when he said he was dieting on his own to avoid using “that [expletive] stickK.com.” What was he thinking?? Of course, Barry’s cri de coeur has something to do with the fact that I’m one of the cofounders of stickK. To be my friend is to know that a stickK contract is an option.? Implicitly, I think Barry as a game-theorist was already thinking a step ahead.? He understood that if he can’t lose weight on his own, he’s going to have to take bolder action. I never realized it before, but the mere existence of stickK is providing a service to some people who know of it but never use it. Part of Barry’s motivation to lose weight on his own is to avoid having to use stickK. I must admit that this indirect commitment effect wasn’t foremost in our minds when my cofounders and I set off to create a commitment store. But we’re happy to be of service. This story is adapted from a diet booklet that I’ve posted just in time for New Year’s resolutions.? It’s The $500 Diet and for a limited time you can read it for free. Most diet books are written by physicians and scientists, but The $500 Diet is my attempt to give economics and contract law a chance to change how much you want to eat. ?It’s a seven-step plan to strengthen your resolve – to help you make credible New Year’s resolutions. Would you rather lose a pound next week or $500? Most people given the choice would find it pretty easy to take off a pound.? That’s the first step.? Now repeat as necessary. Of course, not everyone can afford to put $500 at risk.? But anybody can afford to risk 10 or 20 percent of their disposable income – some amount that is large enough to get your attention.? The booklet shows you how to use stickK.com‘s layers of accountability to craft a diet that will strengthen your resolve. Most diet books obsess about what you should put in your mouth.? But information is not the problem.? You already know that to lose weight, you need to eat a bit less or exercise a bit more.? The $500 Diet is a different kind of diet plan because it doesn’t tell you how much to eat or exercise. You are smart enough-with the help of the Internet and dozens of dieting books-to figure that out. What’s unique about The $500 Diet is that it works on another dimension. It lets you set your own incentives to lose weight. I expect that some of my colleagues will give me grief about publishing a diet booklet.? But I’m participating in a larger trend of law professors breaking the boundaries of law review writing.? My colleagues Jed Rubenfeld and Stephen Carter have written murder mysteries (see, e.g., The Death Instinct and The Emperor of Ocean Park).? My colleague Amy Chua is about to publish an amazing book on parenting, Battle Hymn of the Tiger Mother.? It turns out I’m not even the first law professor to write a diet book.? Susan Estrich beat me to the punch more than a decade ago with Making The Case for Yourself.?? The center cannot hold. I love the idea. It is extraodinarily smart to bring together the science of economics with healthy eating. Specially i find smart the part where eating and excercises, the traditional parts of the diet are left to the discression of the reader. Also using incentives set by ourselves is also very productive and might work very well, this is because now people arent subject to a generalized standard, and now diets can be much more personalized. Also incentives are what move the world, and being able to choose incentives is an incentive to do the diet, so im confident it will work very well. I might even buy a book. How come you aren't rockin' the goat on your Freakonomics pic? "You already know that to lose weight, you need to eat a bit less or exercise a bit more." Apologies for getting slightly off-topic, but that statement isn't really correct. I'd highly recommend the new book by Gary Taubes, "Why We Get Fat and What to Do About It," which actually reminded me of the Ayers/Nalebuff book "Lifecycle Investing," despite being on an entirely different subject. In both cases, the author espoused a view that completely rejects the conventional wisdom and supports it with evidence. Ayers/Nalebuff demonstrated that investment leverage can reduce risk, certainly not a mainstream view, and Taubes explains that we have cause and effect reversed when thinking about obesity: We overeat and fail to exercise because we are getting fat (due to an insulin spike caused by carb-eating), not the other way around. (See the Amazon listing for the book for a more complete description of the theory.) So, it might be useful to apply stickK to the dieting context, but only if it's to motivate people to stick to the non-problematic foods (mainly animal products and non-starchy vegetables). It won't work if people think they're doing the right thing by running for 30 minutes and following that up with a tall glass of fruit juice. The Principle of Commitment? Reminds me of the tosh I used to listen to when I went to Amway meetings. Next you'll be reminding us that according to Freakonomic theory there are no impossibles, merely wonderfully challenging opportunities in which all we have to do to come out in front is to ascertain the likely opportunity cost of every decision. I wish that people would wake up one day and discover that economics is no more a science than is Gestalt Theory. The Emperor has no clothes! You wanna use science to gain insight into the world? Do the hard yards and master mathematical physics. Trouble is? Too hard for the typical NYT reader. None of your wishy-washy, hand waving, feel-good psychobabble pseudo-science for the mathematically challenged masses there. So for feel-good, baby-talk theories about the way the world works, turn to Freakonomics instead. Tedious. Unlike Rocket Science or Brain Surgery, there is no skill, trick or special knowledge to LOSING WEIGHT. Everybody knows the solution! Ask a 5 year old. ANS: EAT LESS and EXERCISE MORE. Every fat person knows this. And 2/3 or Americans are either Overweight or Obese, but despite knowing better are helpless with their condition. But between the IDEA and the EXECUTION lies the Shadow. It is a lack of WILLPOWER, DISCIPLINE and COMMITMENT. ......And it is the same problem with EDUCATION, BUDGETING and FAILING GOVERNMENT. Oh no, weigh-in is tomorrow and I need to drop another 2 pounds! Guess I'll just get even more dangerously dehydrated than last week. This is a great idea. Most people nowadays try to lose weight in very unhealthy ways, skipping meals and spending crazy amounts of time in the gym for example, which is what most people say is the best thing to do. This book though brings something different to the table. It is a great incentive for those people who are like me, and that are tired of trying the same thing over and over again but it never works. 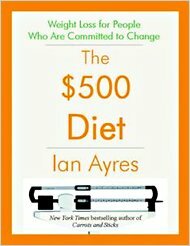 The $500 Diet sounds like a very helpful book because it is something different and interesting that will motivate people to push themselves harder and will make them think at the same time. It is also a more personalized way of getting healthy since you as a reader can use it the way YOU want to. StickK.com can also be very useful but it depends, because some people think that if they spend 1 hour in the treadmill they can later on eat 3 scoops of ice cream and it will be all good because they already excercised. For people like this setting or not setting the goals will be the same. But at the same time it will be of much people to those who need motivation and incentives to push themselves harder and get to where they want to be. I cannot think of anything (outside of the threat of harm to me or a loved one) that would FORCE me to lose weight more than knowing I would have to strut around in a Speedo in front of all my friends. If I'd rather die than do that (and I almost would! ), then I'm sure I'd rather lose weight than do that. Maybe instead of a StickK.com site, we need an "I'll Wear A Speedo" site? I see your Taubes and raise with David Freeman's Making sense of Medicine and Obesity blog. This way of dieting is a very good idea. People are interested in different diets that control their eating by setting a diet menu for the client. The first weeks are good because the menu is new to you but then, when you have 4 weeks or more eating the same things and doing the same routines of cardio workout, the client begins to have more opportunity costs due to the repetition of the same routines and other things left out the he or she was freely opened to. With this form of dieting, the client is taught rather than giving you a menu to follow. This makes you have a big range of diets to choose from and in the end, you have a much larger satisfaction of knowing about healthy eating and at the same time, losing the weight by yourself. This diet has a more long term effect and it is convincing that the money given to follow this diet is worth it. I really like the 500$ idea because it helps you govern your personal decisions, In other words, incentives. Incentives drive people to act the way they do. Not only that, but they also determine what you will buy and in what companies you will invest. So in this case, your incentive is the 500$. Essentially, you will do the best you can in order to avoid having to loose those 500$ dollars. Another important aspect to look at, is that the marginal cost of not loosing weight, are the 500$ and staying how you are. However, the marginal benefit, is loosing weight, getting healthier, and the 500$ you will no longer have to dispose of. This method does however have a catch. In order to go through with this plan you need to have a strong will power. Many, if they don't loose the weight they said they would, probably will keep those 500 dollars. A solution would be to give the money to a friend and instead let him do what needs to be done after the time is up. In the end, the person loosing weight will always try to act in rational self interest, which would be keeping those 500$. The other problem, is that loosing weight is not only about eating less and doing more exercise. Through this process you also need to make sure you are staying healthy. As much as the internet can help you, sometimes it is also good to get help from professionals. @ Andy - You're over complicating the living crap out of this basic formula: calories burned vs. calories consumed. It's as simple (or difficult) as balancing a checkbook. No need to invoke insulin or carbs or any other such diversions; this ain't rocket science. @ Ian Ayres - "But anybody can afford to risk 10 or 20 percent of their disposable income..." REALLY? I know that economists, as a rule, don't inhabit the lower economic rungs of society, but come on. Think about business if you have to; would you ever make the claim that "any business can afford to risk 10 or 20 percent of their disposable income." Many people can not afford to risk ANY portion of their income, especially in the interest of vanity. Thanks to "Hypersonic Weight Loss" I feel young again! I lost 100 lbs in 31 weeks, which was 12 lbs more than my goal! @"It is a lack of WILLPOWER, DISCIPLINE and COMMITMENT." Ha! I think this is so clever. I especially got a kick out of donating the money to anti-charities or frenemies, or better, selling it on ebay! No. 13 - The whole point of the Taubes book is that it's not as simple as calories-in-calories-out. If you don't want to read the book, fine, but in that case we'll just talk past each other. No. 10 - Thanks for the link to the Freedman blog. I'll concede his point that most people don't stick to the low-carb diet, but certainly it would be easier if the medical establishment didn't characterize it as a fad diet that's unsustainable. I find it very easy to stick with the diet in terms of not having hunger pangs and cravings. What's hard is the social aspect of eating in what is deemed to be a weird manner by your family and close friends. « Previous PostCan You Guess the NFL's Top-Selling Jersey?